Welcome back to Jinxie’s Kitchen. While I’m simmering a marinara sauce, take a look at this delicious French dessert. Mmm! Today’s guest post is by Bridgemama, who is working on publishing her cookbook, and she agreed to share this lovely dessert with us. I may have to make this soon. 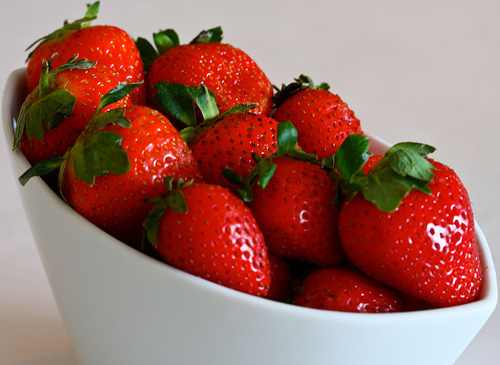 Wish I had some fresh strawberries from California again! Similar to a clafoutis, this classic French dessert is something I make often when strawberries are readily available at the farmer’s market and so sweet and inexpensive! It’s very easy, yet delicious. Remember to choose the smallest dark red ripe berries available for the best flavor. 1. Thoroughly butter a shallow 2-qt. baking or gratin dish. 2. Halve small berries and quarter larger berries, sift cornstarch over top and toss gently until evenly coated, then arrange the berries in the baking dish so that they cover the bottom of dish and set aside. 3. In a blender, buzz eggs, milk, flour, granulated sugar, vanilla, orange zest, Grand Marnier, melted butter and salt until there are no flour lumps. Pour batter evenly over strawberries. 4. Put in the oven and bake until puffy, golden brown, and set in the center – about 45-50 minutes. Remove from the oven and let it cool about 10-15 minutes, sift confectioner’s sugar over top and serve warm.